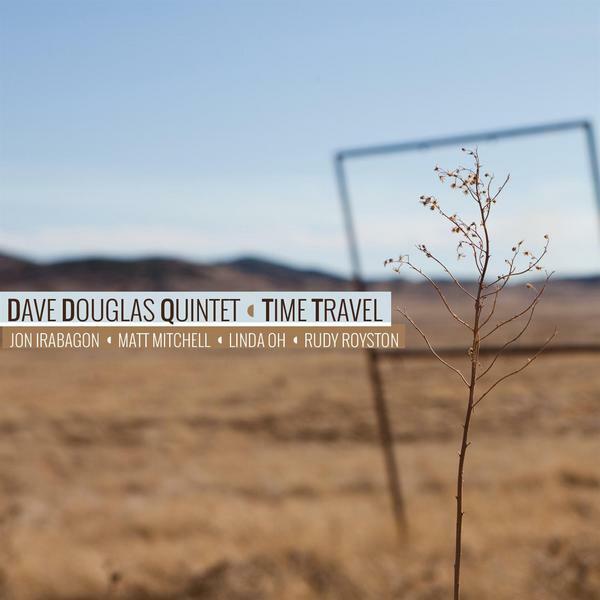 One of my favorite things about Dave Douglas is that he is always doing something new, yet no matter how different a new project may be from his last, it still has his stamp all over it. It’s a testament, I think, that after having released so many outstanding albums over the last couple decades that he is still able to surprise. If you’re like me, you found his album from last fall, Be Still, to be quite a surprise, and a pleasant one at that. I certainly did not expect to hear an album containing hymns that took an Americana roots music approach, yet it worked and I love it. His newest album Time Travel, features the same band as Be Still (Douglas, Jon Irabagon on tenor, Matt Mitchell on piano, Linda Oh on bass, Rudy Royston on drums), save for vocalist Aoife O’Donovan. Despite the same lineup, the music is quite different, from that previous disc, although it is not a grand departure from what we’ve heard from Douglas in the past. The seven compositions are all Douglas’, and more or less fall under a “post-bop” rubric: swinging at times, complex yet hummable tunes written in a variety of meters and forms, and enough flexibility built in to allow for some freer explorations. I think Douglas, or anyone else for that matter would be hard pressed to find a better band. Both Irabagon and Royston seem to be playing on just about everybody’s albums these days, and Linda Oh is headed in that direction. I’m less familiar with Mitchell’s work, but he plays great throughout. Royston might just be one of the baddest drummers at the moment. His command of time is phenomenal, and he messes with it a ton, as he does behind Irabagon and Mitchell’s solos on the medium swinging “Bridge to Nowhere.” For example, check when he jumps up the ride cymbal tempo a la Tony Williams. One of my favorite tracks from Time Travel is “Beware of Doug.” As Douglas explained to the audience at the Blue Room in Kansas City when he played there at the beginning of April,* Doug is an old, toothless and completely harmless cougar (a mountain lion, not a character from the Courtney Cox TV show) who roams through the town of Banff, Canada. The tune is a playful, freewheeling romp that perhaps reflects upon the types of adventures Doug may have had when he was a little younger. Another favorite track is “Little Feet,” which includes a quote of “Mockingbird” built into the head, and the contrapuntal section with some Baroque-isms in the trumpet line is quite interesting. At times the tune has a relaxed and introspective vibe, while others, such as during Douglas’ solo, it’s a little more agitated, a feeling that Royston’s active drums and Mitchell’s jabbing chords and arpeggios help to create. Time Travel is another excellent album from Douglas that shows yet another side of his creative output and showcases great performances from a killer band. I can’t wait to hear what he does next. * a quick note on Douglas’ KC show: he didn’t have his regular band with him, the only regular was Royston. When Douglas last played KC a couple years ago he had his Keystone band, and the Blue Room was packed. Last month there were only about 50 people or so there, and as I looked around the audience, a pretty good majority of them were musicians I knew. It could be that it was a Monday night, in fact the Monday night of the NCAA men’s bball championship game, that he didn’t have his regular band, and that Joe Chambers was also playing in town. I hope those things are what led to the small turnout, and that musicians aren’t just going to see other musicians play. No matter the turn out, Douglas and the rest of the band straight brought it, and it was a great show. If you get the chance to see Douglas live, do it.